Welcome to the Mount Blue Tourist Hostel Pokhara. It is more than just a place to stay where we cater all your holiday needs. It is located in the very close to Lakeside Pokhara with a spectacular view of Fewa Lake and Annapurna Himalayas. Though a newly established property, Mount Blue Tourist Hostel Pokhara is the most affordable accommodations in the Tourist hub at Pokhara. We’ve got all your needs covered: from a safe, accessible location, comfortable beds and clean bathrooms with Free BREAK FAST. When you feel like taking a break, you can easily walk to the fewa lake for a few Minutes and you are there are the place to relax. we’ve even got a cozy common room you can take a pick from. 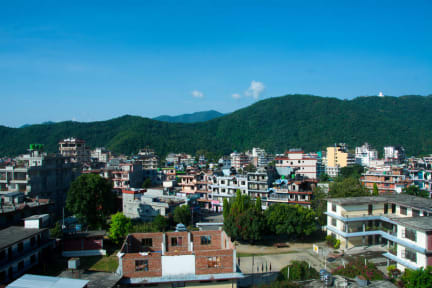 As locals, the team of the hostel knows Pokhara inside out and is always there to help you experience the city less as tourists, and more as a part of the crowd. 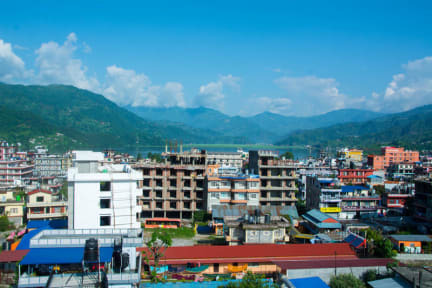 Our motto is to make your stay in this nature City pokhara meaningful. Any sort of help you Need, we are at our service, like help planning an itinerary beyond. Really clean and nice place. Great hostel, nice staff and free breakfast! Precisely what we backpackers always look for : wonderful, friendly hosts who spend time with you and are always there to help ; best location, close to everything but at the same time not on the busy touristy street; common balcony, super convenient for meeting fellow travellers. Best atmosphere. Thank you so much! Good value! Nice rooms and hostel, Balu is helpful, free drinking water. Showers are often cold as they're solar showers and the breakfast is small but nice (small Omelette and chocolate croissant). Not super busy to get to know people but fine. Can recommend. Really nice staff who seem to genuinely care -- but there were a few issues here.. wifi inconsistent, no hot showers, toilet made noise so we had to turn off the water between uses, drinking water always empty, no keys for the dorms. Otherwise, it's worth what you pay for, I guess -- beds were comfortable and clean, outlets and lights for each bed, located just a few minutes from the main streets. They stored our things during trek for free, as long as we stayed again afterward (we did). Overall a nice stay, and the owners were helpful given their limited English. A pipe in the bathroom was leaking so the floor was all wet during my stay. Nice little home turned into a hostel. Pros - 1. Just four bunks in a room, less disturbance, good sleep. 2. Nice comfortable mattress and linen. 3. Good warm shower. Cons - 1. Washroom plumbing is terrible with feaces floating no matter how much you flush! 2. The free breakfast is a joke. Just one piece of bread with fried egg and black tea. No butter or jelly! 3. Cleaning lady speaks too loudly in the morning! Overall - might not choose to stay here again!